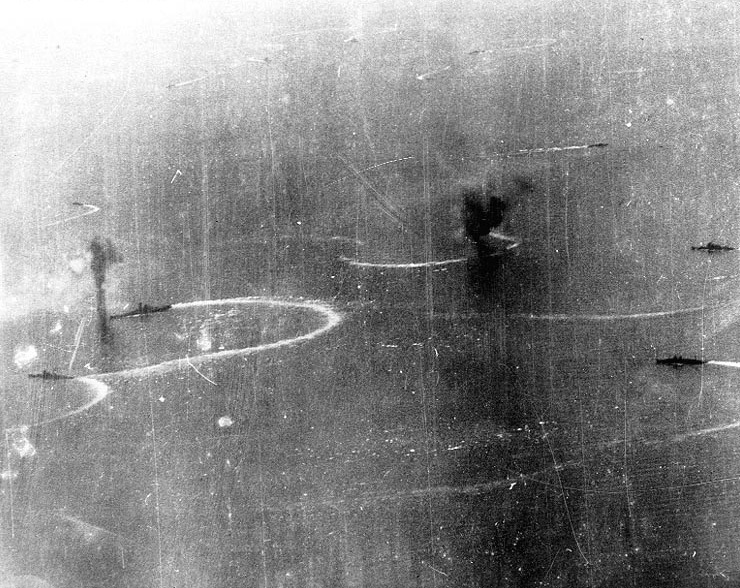 Yamato or her sister ship Musashi (middle left) maneuvering in the Sibuyan Sea while being attacked by American carrier aircraft, 24 October 1944. Also maneuvering at speed, there is a heavy cruiser off the battleship's port bow, and two more heavy cruisers on the far right of the photograph. Source: Official U.S. Navy Photograph, now in the collections of the National Archives (# 80-G-272550). If you have spotted any errors on this page (Battleship Yamato or her sister ship) or have anything to contribute please post it on the battleship forum.